Mike, can you give a little bit of information about how you became a Learning Rep and why you got involved? I became a learning rep 3 years ago when an opportunity came up at the branch office. I’ve always had an interest in education and I saw this opportunity as a chance to promote the wider learning agenda for UNISON members at the Council. Council workers will see me and my colleague, Paul Hunt, out and about in the Council chatting to staff on their lunchbreaks and telling them about the learning opportunities offered by UNISON. I really enjoy this aspect of the role. What sort of things does UNISON offer and have you any examples of successes? 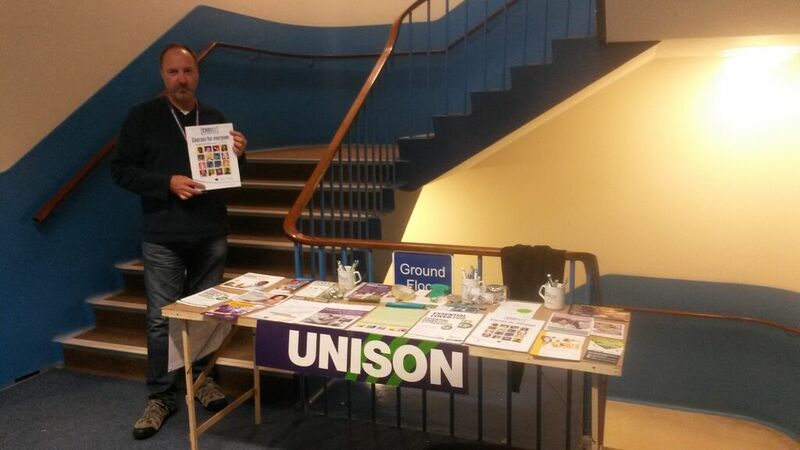 In the West Midlands, UNISON is the only trade union to have its own learning website for activists and members alike. Once signed up, UNISON members can access courses available at our regional office. In Coventry, we have set up our own branch learning website which contains all the options available for members keen to get back into learning. In terms of success, we have seen more people taking up the option of free ‘Skills for life’ courses. Since the beginning of the year, Coventry City branch has engaged in an education project at Whitley Depot. The canteen now has its own area with computers for staff to use and a Beacon information screen. We have also requested the setting up of a room dedicated to education & learning. This will mean staff can access computers to undergo training, e-learning and visit the learning portal on beacon. We have also been successful in encouraging members to claim for book grants, learning grants and bursaries to support their studies. Could you explain what a workplace union learning rep is, what support there is from the union and employer and why members should think of becoming a workplace learning rep? The workplace learning rep role has the same rights as stewards and health and safety reps and works alongside them in an increasing number of UNISON branches. Having an interest in developing learning with UNISON and learning in general. Helping out others who are getting back into learning (sometimes after a long period of time). Working with the branch education team to get the employer to think more about training and learning and development opportunities for UNISON members. Raising awareness about the learning needs of you and your colleagues. Helping involve more people in UNISON to push the learning agenda for all. In simple terms: If you have an interest in promoting and providing learning opportunities for people, this could be the perfect role for you. You will be supported by the branch ULR’s who will provide you with all the relevant training to carry out the role. If members are interested, how can they get involved? *Coventry UNISON branch will be moving back to KOCO building in mid-December. Once we have the new branch phone number will email out to members. This entry was posted in Book grants, Education & Learning, Learning and tagged Beacon, Book grants, Computers, Coventry City Council, Coventry City Unison, COVENTRY GMB, COVENTRY UNITE, Education and Learning, GMB, How do I join Unison in Coventry, Trade Unions, UNION LEARNING REP, Unison help with learning, Unison Learning Grants 2015, Unison West Midlands, Which trade union should I join in Coventry?, WHITLEY DEPOT, Workforce Development, World Book Night. Bookmark the permalink.